Tunable Laser Optics, 2nd Edition: 171 figures, 44 tables, 746 equations, 72 problems, and 546 archival references in 323 pages. "Details of interferometric interactions within the tunable laser cavity are precisely described using the Dirac-Feynman approach. Duarte demonstrates a grasp of this powerful quantum mechanics tool that is unparalleled in any other laser text. The chapters applied show such a level of understanding of this material that could be represented by only a handful of scientists in the world. This topic truly is Duarte’s forte’. The transition of the two slit interferometry to the N-slit problem also demonstrates the power of the Dirac-Feynman-Duarte approach. I want a copy of this book. Nowhere else is there such a clear and concise description of the Dirac-Feynman, and dare I add, Duarte, approach to diffraction and interference theory and applications. This is using quantum mechanics in a very pragmatic and useful way!" "Dr. Duarte is the world’s foremost expert in the area of tunable lasers and has once again written what will become the standard reference for laser researchers. His use of the Dirac Optics notation for compact and concise tracking of the interferometers spectral tuning is not only brilliant physics but also brilliant pedagogically! Tunable Laser Optics is a definite must have for anyone interested in designing or understanding the physics and engineering of tunable laser systems. It will be a standard for both professionals and students alike! I myself designed a number of tunable laser systems and can tell you that there are no other books that come anywhere close to this presentation." T. M. Shay, Research Professor, University of New Mexico, USA. "Tunable Laser Optics is a concise, accessible, and comprehensive review of the field. The book starts from essential physics, and mathematically builds the fundamental equations governing the phenomena related to lasers and laser optics in a clear manner, with outstanding use of figures to illustrate the various points. Incorporation of numerous examples of experimental data alongside the analytical calculations provides an excellent grounding for the reader, and sets the material apart from other texts. In this 2nd edition, updates have been made which incorporate relevant progress in other areas of tunable lasers and laser optics, bridging the gap from first principles to the real- world technological issues. The book should be considered essential reading for theoreticians and experimentalists working in the field today." K. M. Vaeth, VP Engineering, MicronGen, USA. "A coherent presentation of the basics of optical resonators for tunable lasers, based on Duarte’s extensive application of the Dirac bra ket procedure to optics. This material is presented concisely, but with sufficient detail so that the reader can clearly understand the application of this approach to tunable laser optics. 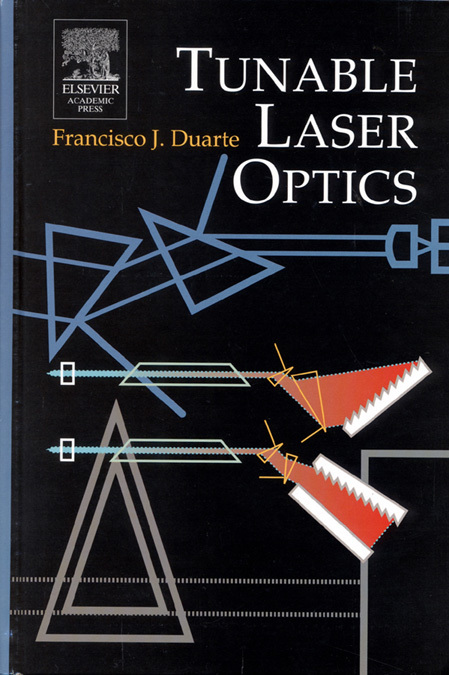 The book’s emphasis on the tuning optics provides the common thread connecting the wide range of laser systems discussed and makes it particularly useful to anyone using or constructing tunable laser systems. This second edition of Tunable Laser Optics extends the material presented to be applicable to quantum well, quantum cascade, and quantum dot lasers." I. S. Falconer, Hon. Senior Lecturer, School of Physics, University of Sydney, Australia. "I like the examples given in the text… Even a physicist who is not expert in laser optics can replicate the examples, test the theory, and design such good lab experiments for students… The topics presented are well referenced and several results are shown with pictures and numerical data. This book gives a thorough review of laser optics with many worked out examples … These kinds of detailed descriptions of the experiments are not easy to find in a textbook." E. Gramsch, Professor of Physics, University of Santiago, Chile. Tunable Laser Optics includes 134 figures, 34 tables, 547 equations, 52 problems, and 435 archival references in 272 pages. Detailed solutions to the problems will be made available, in PDF form, to professors and faculty using Tunable Laser Optics as a textbook. Please e-mail if you are interested. A list of corrections, for the readers of Tunable Laser Optics, is available in PDF form. 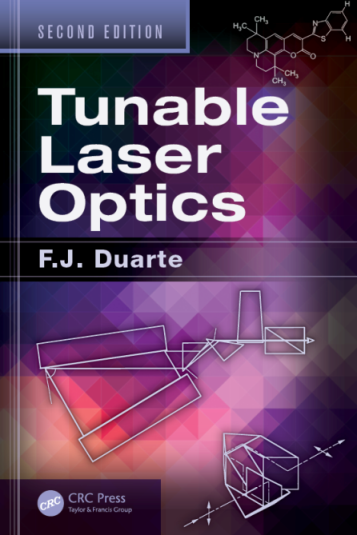 "Tunable Laser Optics is a well-organized and well-written book that was conceived for very practical purposes. It serves as a handbook but is actually much more than that... The author first establishes a good mix of the physical theory and then discusses the details and design considerations for tunable laser optics systems. The reader gains great insight and understanding into... tunable laser optics. I enjoyed the book and commend F. J. Duarte on another addition to his already impressive resume in optical science." 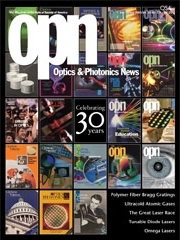 D. Finsmith, Optics & Photonics News 16 (7), 62 (2005). "The use of Dirac's notation for the calculation of the interference and diffraction effects of the tuning elements proves an elegant and powerful technique for designing tunable laser systems. The complete coverage of the technical area and the easy readable writing style of the author will ensure that Tunable Laser Optics will be a classic reference that will be enjoyed by both students and researchers. I give Tunable Laser Optics my strongest recommendation." "The Dirac notation and the Heisenberg uncertainty principle are used to explain properties of light. This gives a solid mathematical and physical background to solve the optics problems arising in the design and construction of tunable laser optical systems... Tunable Laser Optics introduces the warfare that a student, or an experimentalist, needs to understand for the successful design and construction of tunable lasers and optical devices." K. Osvay et al., Measurement of non-compensated angular dispersion and the subsequent temporal lengthening of femtosecond pulses in a CPA laser, Opt. Commun. 248, 201-209 (2005). F. Lopez Arbeola et al., Structural, photophysical and lasing properties of pyrromethene dyes, Int. Rev. Phys. Chem. 24, 339-374 (2005). M. Meinhardt, Tunable lasers: investigating UV effects with monochromatic light, in UV Conference, New Zealand, 2006. W. T. Chyla, On generation of collimated high-power gamma beams, Laser Part. Beams 24, 143-156 (2006). T. Chung et al., Solid state spectral narrowing using a volumetric photothermal refractive Bragg grating cavity mirror, Opt. Lett. 31, 229-231 (2006). T. Chung et al., Spectral narrowing in solid state lasers by narrow-band PTR Bragg mirrors, SPIE 6216, 621603 (2006). J. Bañuelos Prieto et al., Concerning the color change of pyrromethene 650 in electron-donor solvents, J. Photochem. Photobiol. A: Chem. 184, 298-305 (2006). U. N. Singh et al., Lidar Remote Sensing for Environmental Monitoring VII (SPIE, Bellingham, 2006). J. Bañuelos Prieto et al., Photophysics and laser correlation of pyrromethene 567 dye in crosslinked polymeric networks, J. Lumin. 126, 833-837 (2007). C. Karnutsch, Low Threshold Organic Thin Film Laser Devices (Cuvillier, Göttingen, 2007). S. Bandyopadhyay, Dissimination of Information in Optical Networks (Springer, Berlin, 2008). D. Malacara, Optical Shop Testing, 3rd Ed. (Wiley, Hoboken, 2008). F. K. Kneubühl and M. W. Sigrist, Laser, 7th Ed. (Vieweg & Teubner, 2008). N. Singh, Analysis of the spectral variation of a dye laser by gain medium inhomogeneity, Opt. Laser Technol. 42, 225-229 (2010). K. R. Chen, Focusing of light beyond the diffraction limit of half the wavelength, Opt. Lett. 35, 3763-3765 (2010). K. R. A. Hazzard, Quantum Phase Transitions in Cold Atoms and Low Temperature Solids (Springer, Berlin, 2011). N. Singh and H. S. Vora, On the coherence measurement of a narrow bandwidth dye laser, Appl. Phys. B 110, 483-489 (2013). N. Singh et al., Studies on gain medium inhomogeneity and spectral fluctuations coupled with a high repetition rate dye laser, Laser Phys. 23, 125003 (2013). F. Sun et al., Super thin Mikaelian lens of small index as a beam compressor with an extremely high compresion ratio, Opt. Ex. 21, 7328-7336 (2013). X. Xin, A Quantum Light Source for Light-Matter Interaction (University of Toronto, Toronto, 2013). M. V. Putz, Quantum and Optical Dynamics of Matter for Nanotechnology (Engineeering Science Reference, 2013).